A healthy way to mist salads, coat fry pans, veggies and more! An elegant mister for any oil. Use to mist fry pans, veggies, and salads. Spreads a thin, even coating of oil with the push of a button. You choose the quality and type of oil to use. Built-in, clog-free filter ensures even spray distribution. Great for low-fat, no-mess cooking. Use it to prepare veggies for grilling, mist bake ware before dusting with flour and control the amount of oil used when you saut? and stir-fry. Also great for oiling bruschetta. 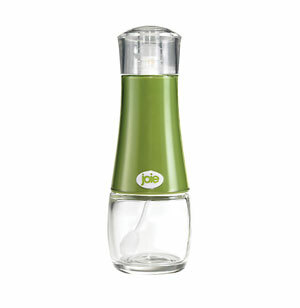 Easy-to-fill, wide-mouth glass oil reservoir. Non-aerosol, BPA-free housing and mechanism. Make professional Chef Grade meals fast and easy. Save time and avoid messes while cooking. Add all the flavor, but far fewer calories. Glass bottle with base, and top with filter. The glass base is dishwasher-safe. Hand wash top section in warm soapy water.